PQQ jest jedyną obecnie substancją dostępną w formie suplementu diety, która w badaniach przedklinicznych nie tylko chroniła mitochondria w komórkach przed uszkodzeniem przez wolne rodniki, ale również aktywowała, poprzez wpływ na DNA/geny, produkcję nowych mitochondriów i w ten sposób miała korzystny wpływ na wytwarzanie energii przez komórkę. Zdaniem wielu naukowców, ilość mitochondriów w komórkach oraz jakość ich pracy, jest wyznacznikiem potencjalnej długości życia oraz ryzyka zachorowania na przewlekłe choroby degeneracyjne. PQQ jest kolejnym koenzymem (po Koenzymie Q10), który od zaledwie kilku lat dostępny jest w formie suplementu diety. 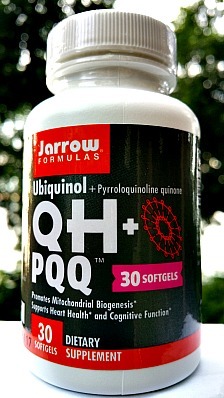 O ile Ubichinol/Ubichinon (Koenzym Q10) jest niezbędny do prawidłowej pracy mitochondriów i do właściwego wytwarzania energii z pożywienia, to PQQ również chroni te niezwykle ważne organella komórkowe przed uszkodzeniem i może pomagać w powstawaniu nowych mitochondriów. Oba suplementy (PQQ i Koenzym Q10) najlepiej działają kiedy stosowane są razem. Exp Gerontol. 2016 Jul;80:43-50. doi: 10.1016/j.exger.2016.04.008. Epub 2016 Apr 14. Pyrroloquinoline quinone enhances the resistance to oxidative stress and extends lifespan upon DAF-16 and SKN-1 activities in C. elegans. Wu JZ1, Huang JH2, Khanabdali R3, Kalionis B3, Xia SJ4, Cai WJ5. 1Department of Geriatrics, Shanghai Institute of Geriatrics, Huadong Hospital, Fudan University, Shanghai 200040, China; Institute of Integrated Traditional Chinese and Medicine and Western Medicine, Huashan Hospital, Fudan University, Shanghai 200040, China. 2Institute of Integrated Traditional Chinese and Medicine and Western Medicine, Huashan Hospital, Fudan University, Shanghai 200040, China. 3Department of Maternal-Fetal Medicine Pregnancy Research Centre, University of Melbourne Department of Obstetrics and Gynaecology, Royal Women's Hospital, Parkville 3052, Australia. 4Department of Geriatrics, Shanghai Institute of Geriatrics, Huadong Hospital, Fudan University, Shanghai 200040, China. Electronic address: xiashijinhd@163.com. 5Institute of Integrated Traditional Chinese and Medicine and Western Medicine, Huashan Hospital, Fudan University, Shanghai 200040, China. Electronic address: caiwaijiao@126.com. Adv Exp Med Biol. 2016;876:319-25. doi: 10.1007/978-1-4939-3023-4_40. Itoh Y1, Hine K1, Miura H1, Uetake T2, Nakano M3, Takemura N4, Sakatani K4,5. 1Department of Psychology, Keio University, Tokyo, Japan. 2CX Medical Japan Co., Inc., Tokyo, Japan. 3Niigata Research Laboratory, Mitsubishi Gas Chemical Co., Inc., Niigata, Japan. masahiko-nakano@mgc.co.jp. 4Department of Electrical and Electronics Engineering, Laboratory of Integrative Biomedical Engineering, College of Engineering, Nihon University, Tokyo, Japan. 5Department of Neurological Surgery, School of Medicine, Nihon University, Tokyo, Japan. J Nutr Sci Vitaminol (Tokyo). 2015;61(3):233-40. doi: 10.3177/jnsv.61.233. 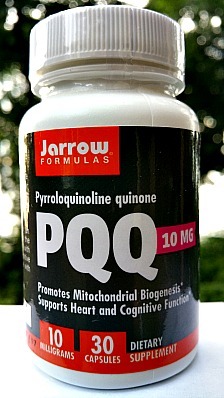 Effects of Pyrroloquinoline Quinone Disodium Salt Intake on the Serum Cholesterol Levels of Healthy Japanese Adults. Nakano M1, Kawasaki Y, Suzuki N, Takara T.
1Planning and Development Division, Natural Gas Chemicals Company, Mitsubishi Gas Chemical Company, Inc.
 Anticancer Agents Med Chem. 2015;15(10):1297-304. A Novel Quinoline Based Second-generation mTOR Inhibitor that Induces Apoptosis and Disrupts PI3K-Akt-mTOR Signaling in Human Leukemia HL-60 Cells. Kumar S, Guru SK, Venkateswarlu V, Malik F, Vishwakarma RA, Sawant SD, Bhushan S1. 1Senior Scientist, Division of Cancer Pharmacology, Indian Institute of Integrative Medicine, CSIR, Canal Road, Jammu, 180001 India. sbhushan@iiim.ac.in. J Cancer. 2014 Jul 29;5(7):609-24. doi: 10.7150/jca.9002. eCollection 2014. Pyrroloquinoline Quinone Induces Cancer Cell Apoptosis via Mitochondrial-Dependent Pathway and Down-Regulating Cellular Bcl-2 Protein Expression. Min Z1, Wang L2, Jin J3, Wang X1, Zhu B2, Chen H4, Cheng Y5. 51. Biomedical Research Center, Zhongshan Hospital, Fudan University, Shanghai 200032, China; ; 3. Shanghai key laboratory of organ transplantation, Shanghai, 200032, China; ; 5. Department of Hematology, Zhongshan Hospital, Fudan University, Shanghai 200032, China; ; 6. Department of Hematology, Zhongshan Hospital Qingpu Branch, Shanghai, 201700 China. J Biol Chem. 2010 Jan 1; 285(1): 142–152. 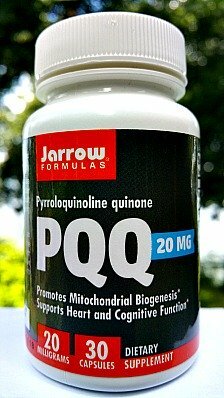 Pyrroloquinoline Quinone Stimulates Mitochondrial Biogenesis through cAMP Response Element-binding Protein Phosphorylation and Increased PGC-1α Expression. J Nutr Biochem. 2013 Dec;24(12):2076-84. doi: 10.1016/j.jnutbio.2013.07.008. Harris CB1, Chowanadisai W, Mishchuk DO, Satre MA, Slupsky CM, Rucker RB. 1Department of Nutrition, University of California, Davis, CA 95616.